Highly recyclable, PET or PETE (polyethylene terephthalate) is a plastic resin and a form of polyester. Polyethylene terephthalate is a polymer created by the combination of two monomers: modified ethylene glycol and purified terephthalic acid. It was first synthesized in North America by Dupont chemists during the 1940s. Labeled with the #1 code on or near the bottom of bottles and containers, PET is frequently employed to package a range of products including beverages, peanut butter, bakery goods, produce, frozen foods, salad dressings, cosmetics, and household cleaners. Prized for its strength, thermo-stability, and transparency, PET is a popular choice for packaging. PET also is inexpensive, lightweight, resealable, shatter-resistant and recyclable. Recycled polyethylene terephthalate is known as RPET, and it is the most widely recycled plastic in the world. According to PETRA, the PET Resin Association, the U.S. recycling rate is about 31% in 2012, while it is 52% in the European Union. In 2016, the U.S. recycling rate had fallen below 29%. Almost 1.8 billion pounds of PET were recycled in 2015, used to make a to make a variety of end products. The U.S. EPA estimates that 1% of municipal solid waste in the U.S. is attributed to PET containers. The use of recycled PET in place of virgin resin typically results in reduced energy consumption, lower cost, and reduced environmental impact. Post-consumer PET material is collected through curbside recycling programs, involving both single-stream and dual-stream approaches. Additionally, other PET recycling programs are designed to divert empty PET bottles at locations of high accumulation such as large events. Recyclable materials such as PET may be sorted from other recyclables at material recovery centers, and baled for shipment to a PET recycling facility.As with other scrap material, attention should be used to promote proper bale handling and storage practices to minimize product contamination. After arriving at a recycling facility, bales may staged before placed the conveyor and ​fed to the bale breaker. Bales are then split open, and bottles are singulated. This material may be pre-washed, and labels removed, using steam and chemicals. During the pre-wash stage, bottles sent through a hot water or hot air trommel will result in PVC bottles turning slightly brown, providing for easier identification and removal during the manual sorting. The pre-wash and label removal allows for easier identification of material using Near Infrared (NIR) sorting equipment to remove other materials. Other technologies employed include metal detectors and manual sorting belts. Manual sorting techniques may include either positive (removing the PET from the material flow) or negative (removing the non-PET material) sorting. After they have been sorted, the PET material is ground into particles known as “flakes.” Flake purity is central to preserving the value of the reclaimed plastic. Further separation techniques involve washing and air classification as well as water baths (sink/float) to separate residual foreign materials. Washing can be undertaken at standard or elevated heat levels. The use of disinfectants and detergents aids in achieving a complete cleaning. After the completion of grinding, washing, and separation steps, the material is rinsed to eliminate any remaining contaminants or cleaning agents. The recycled PET is then dried before reintroduction as a manufacturing material or before further processing. Melt filtering can further purify material through the removal of any non-melting contaminants that may have survived earlier steps. Extruded material passes through a series of screens to form pellets while non-melted particulate is blocked. Pelletized plastic provides a uniform-sized material that can be reintroduced into the manufacturing process. 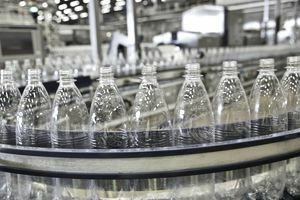 Companies increasingly recognize the urgency of recycling PET into food grade products such as new beverage containers. Coca Cola intends to use 50% recycled PET in its containers by 2030. While food-grade processing has been established, efforts are being made to improve the efficiency of processing technologies. The availability of post-consumer PET material is also a challenge. Recovery rates in the U.S. have remained flat or declining in recent years. This situation has been exasperated by less material generation through curbside recycling programs, which in turn is related to the decreasing popularity of carbonated beverages, as well as trends towards the design of increasingly light bottles. One way to improve PET recovery would be through the use of container deposit systems. To find out more about PET recycling, visit the Association of Plastics Recyclers or PETRA.